Kopf Micro Manipulators are designed and manufactured to provide new standards of pre-cision in micro positioning. No other manipulators in the stereotaxic field approach their performance or reliability. Very close tolerances are held in production with all dovetail slides precision ground. This, along with backlash free drive screws and the sheer mass of the manipulators, assures the most accurate placement of electrodes as well as a degree of repeatability impossible to find in any other manipulator. Positive locks are provided for all articulating surfaces except the screw driven vertical and lateral slide. The end of the lateral slide has a precision “V” groove and locking thread to which electrode holders and accessory equipment may be attached quickly and easily. Manipulator X, Z adjustment – Metric vernier scale 80 mm travel. Calibrated dial – 10 micron increments,1.0 mm of travel per revolution. 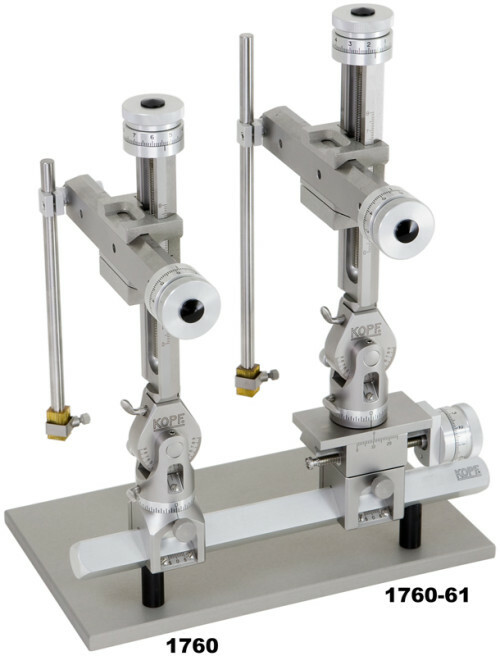 Manipulator Y adjustment – Metric scale 25 mm travel. Calibrated dial – 10 micron increments, 1.0 mm of travel per revolution. Model 1760 Manipulator can be upgraded to include the fine adjustment A/P slide assembly. Call factory for details. The most rigid, versatile and accurate manipulators available. Precision, backlash free screw drives assure accurate placement and repeatability. Simple to operate and requires no allen wrenches for use.